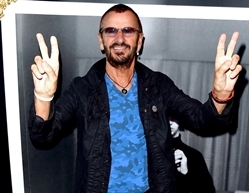 Ringo Starr Announces Details for 10th Annual Peace & Love Birthday Celebration. Beatles Radio: The Beatles, Solos, Covers, Birthdays, News The Fab 4 and More! Sir Ringo Starr has a birthday coming up, and to celebrate he wants us all to spread a little Peace and Love. Everyone’s favorite knight of the realm will observe turning 78 on July 7 by inviting the world to come together in a moment of peace, love and unity. Starr himself will be in Nice, France at the Hard Rock Cafe — a fitting location considering he started the tradition 10 years ago at the Chicago branch of the franchise. But don’t worry if you can’t make the trip. All he asks is for everyone — everywhere — to think, say, or post “#PeaceandLove” at noon their local time, thus creating a wave of positivity that will travel across the globe.